On an aside, sure makes for a change to see a desi designer up on one of these covers! We aren’t saying one is good over another, just that it makes for a welcome change. She should wear her hair like it is on the cover all the time! I don’t like the dress at all, would never wear it..I mean,who would? The bottom in this especially is so unflattering, it’s almost as though these dresses are for show and not actual wear. Haha and I love the cover of Living! Love the silver sequinned leg pads and the fact that she’s wearing a Royals shirt with a corset over it! It’s genius! Love this cover, just wish her hair was as it was in Grazia! IDK… no matter what she does.. what hair / dress/make-up she wears, I never like her.. But still, the make-up on Grazia cover is nice. yea I agree about the dress on the cover of grazia —some of them can look nice but mostly they are all just really weird shaped (duh) and just plain unflattering. YAY! and SEE!! She looks so much better with the flat do! Sometimes pictures are created to inspire and so are clothes. The picture is stunning and Ssilpa looks stunning in it. As far as the shape is concerened its not ment to be wearable its the designer having fun with it and has ended up doing a great job….as far as wearbility is concerned I am sure there are a wide variety of shopping pages in the issue with beautiful earable garments. Don’t like her eye makeup. Should have been blened better maybe? I guess the first thought that would pop in most people’s mind, on seeing the dress (Grazia), will be, Balenciaga done very badly (and 2 seasons too late!) And I’ll have to agree!! she has same expression for all the shoots or what? that slutty expression.. urh! she needs to re-shape those eyebrowsss..i think that’s where the vulgarity comes from. I liked both the covers. The second one is high on originality, never mind the hairdo! One has to appreciate the lady who’s carefree about her looks and non-fussy, i think its really brave of her to have worn a her teams t-shirt and a corset over it. I checked out the magazine as well, its fabulous.The magazine is Hi! Living and not Hi Blitz Living….you guys made a boo-boo….! never expected that from you. Oh my god. The other day, my friend was naming who was on his top 5 list for beautiful actresses in Indian cinema and Shilpa was in his list. At that time I was surprised because while I think Shilpa deserves the most credit ever for her maintaining her stunning figure, I never thought of her as top 5 material.. but in this pic (Grazia) she is JUST TOOOO STUNNING! One comment.. I hate the rounded eyebrows she has in the top cover.. I prefer the arched brows she has in the Living cover. I think the cover of Grazia just looks amazing. Meh! nowt special – she looks how she always looks apart from the hair and even that can’t distract me from the meh-ness of it all. the top half certainly scores well with me but the bottom half….not really…. I am not a big fan of these tulip dresses. The Hi Living cover sure has a good idea, but very very boring look. Same old hairstyle, same pout……. I don’t think the dress on the Grazia cover is cover-worthy at all, nothing pops with the dress. It’s a nice dress and all, and her body is always on point! keep up the great work by supplying me with enough air to breath…. I don’t think the dress on the cover is for real life use,what with the chicken feathers and stuff, but it does give a bit of drama to the picture. Shilpa looks good, as always. Love her hair here. She looks fab altho the dress sure isn’t very scoring!! But then again, I agree with you guys, it does make for a refreshing change to see an Indian designer featured on the cover of an int’l mag!! And I’ve got to say, I hated the Cosmo cover featuring Shilpa, more than I dislike the Hi Blitz one!! I didn’t like both of the covers her expressions r so out of place..
the dress is horrible! her face looks fine.. dont like the cover too much! 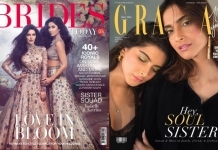 love the grazia cover…..all these actresses in my opinion should start experimenting with edgier looks(which also includes the hair and make up) because most of these ladies may wear some ‘edgy’ pieces (to their standards) but the trademark bolly wood hair(read curly wavy long extensions) kill it!! Shilpa’s hair looks good on the cover but the dress is ugly. She never looks real to me. Something is off. I love love love the dress on the first cover. Love the hair on the Grazia cover. The Hi Living one is truly ridiculous! This is actually Grazia’s May edition. If you look carefully, May 2009 is written just below “Volume 2 Issue 2” on the left hand side.